Remember that The Simpsons episode where Starbucks swallows every store in Springfield mall? “… Bart, while walking through the Springfield Mall, passing several Starbucks, goes into a store called “In and Out Piercing”. Bart: I’d like to get my ear pierced. New York City was one of the last markets that Starbucks entered, mostly because of high real estate costs. But besides Starbucks, there are two types of businesses that swallow an enormous portion of commercial space in NYC: drugstores and banks. Whenever you see a sizable store for rent, it’s almost inevitable that it will become a drugstore or a bank. The drugstore business is not particularly profitable, but one chain, Duane Reade, seems to be opening store after store. In my neighborhood there are two Duane Reades one block from each other, and several other equally lame pharmacies. There’s an interesting article called The Mystery of Duane Reade which among other things, addresses a question just as interesting as “Who is John Galt.” Unlike Galt, Duane Reade is not really a person. The crummy drugstore chain derives it’s name from the first store that was located on the corner of Duane St. and Reade St. in Manhattan. Banks are even worse real estate hogs, and are popping up even faster than Duane Reade and Starbucks. There are two stores that went out of business recently in my neighborhood, and both are being replaced by banks. There’s a bank across the street from where I live, and one or two on almost every block. Yet there are no supermarkets bigger than a tiny little Pioneer in a 20 block radius. The stiff competition is forcing banks to offer new services to attract customers. Commerce Bank, for instance, offers a service called “Penny Arcade.” They basically have change-counting Coinstar machines without the fee. All you have to do is get the receipt from the machine, and the cashier will exchange it for paper money. 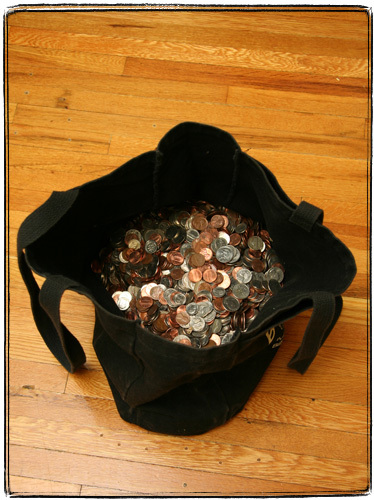 During the last major cleaning fit that I had, I took my overflowing coin bowl and dumped it into a canvas bag. I weighted it on my Health-o-Meter physician’s scale which is exact to within 1/4 lb. The scale read 29 1/2 lb. 12.423876 kg = 27.3899581 lb. That’s about 2.1 lb difference from my original weight. The machine rejected a Chinese coin, two Boston subway tokens and a few coins with gunk on them. The bag probably weights at most 1/2 lb. So it seems that the coin-counting automaton cheated me out of a pound of coins. That’s about 9 bucks by my calculations. [Update] I’m told that pre-1982 pennies weight 3.1 grams instead of 2.5, so my calculation is a bit off. 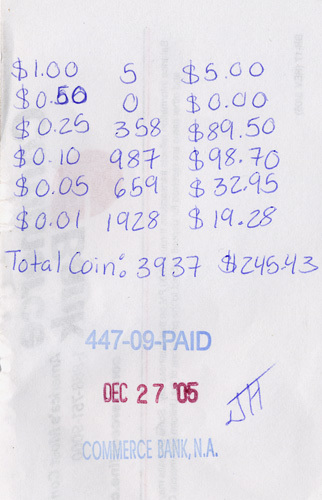 “For consistency, we began with equal piles of $87.26 worth of pennies, nickels, dimes, and quarters that we had gotten from a local bank in coin envelopes. 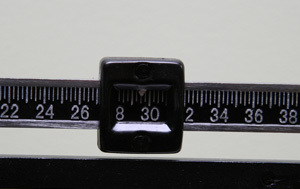 Health-O-Meter Physician’s Balance Beam Scale: a must have weapon in the battle of the bulge. 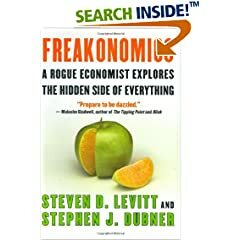 A “rogue” (read “somewhat sloppy, but very interesting”) economist tries to answer tough questions, such as: What do schoolteachers and Sumo wrestlers have in common? How is Ku Klux Klan like a group of real-estate agents? Why do drug dealers still live with their moms? Where have all the criminals gone?